Invented in the 1940's but made popular in the 1960's, this is a beautiful rum-based Cocktail that oozes Tiki Culture. If you can shout, "Maita'i roa ae!" then you are certainly part of the Tiki Culture. The phrase means, "Very Good!" / "The Best"
Combine all the ingredients into a Boston Shaker over ice. Shake. Strain into a Cocktail Glass. Garnish with Lime, sprig of mint and a Maraschino cherry. 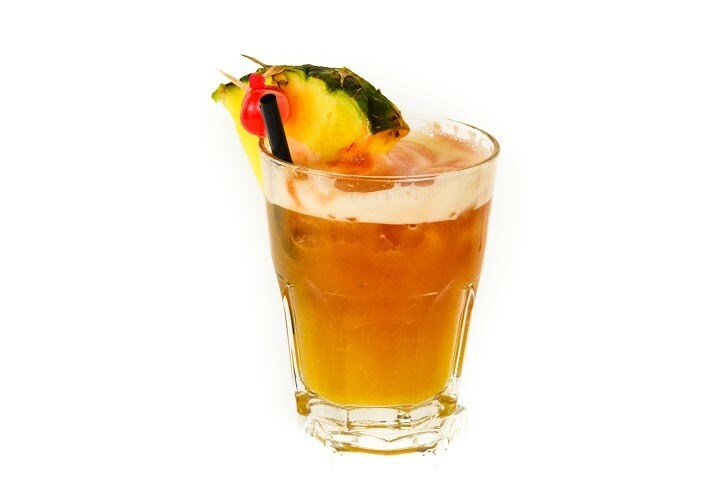 The Mai Tai is claimed to be invented in 1944 by Victor Bergeron at his Trader Vic's Restaurant in Oakland, California. However as legends go, 11 years previously Don The Beachcomber, a rival of Bergeron claimed he invented it at his Hollywood restaurant, "Don The Beachcomber". The two versions are not really the same; Don's being more complex overall. There are as you can imagine many versions and variations of the Mai Tai that have been invented created over the years. It is loosely based on the image and feel of Tahiti - rnce very popular at Polynesian, Tiki Bar -type of parties and events. The Rocks Glass is known by several names - depending on where you are in the country and in which Cocktail lounge you are in. It can be referred to as "An Old Fashioned", a "Tumbler", a "Whiskey" glass or even a "Low Ball" glass. This is a small glass with usually two or three ingredients only. So called 'rocks' as they drink in this glass will contain invariably 'ice cubes'.